Since 1950 the Order of the Arrow Service Corps has provided the example for how Arrowmen should act and cheerfully serve others. The Service Corps' seeks to provide servant leadership through cheerful service to the program areas of the Jamboree. We seek create an environment conducive to servant leadership, cheerful service and a memorable experience while facilitating the needs of the 2010 National Jamboree. We live out our obligation, daily. The OA Service Corps represents what the OA stands for, we represent servant leadership. The 2010 National Scout Jamboree is our time to show the nation that we are fulfilling our obligation; we are putting into practice its meaning. The OA Service Corps is about representing the OA and having fun. All arrowmen will work together, with no titles, no awards, and no regrets. This experience will be one that you will never forget. Join our team and you will make friends to keep for the rest of your life. 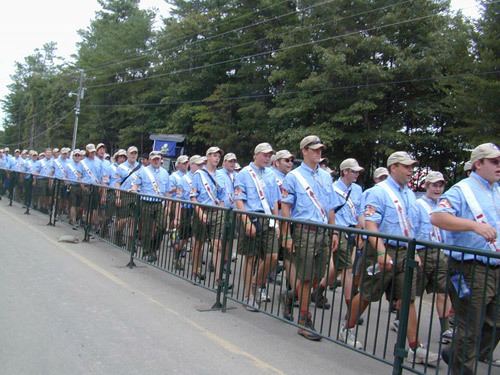 If you want have to best time of your life while wearing a sash at the 2010 National Scout Jamboree then come join the OA Service Corps.